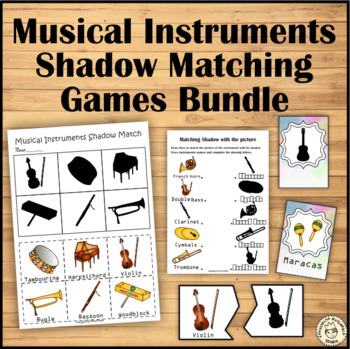 Are you looking for fun and engaging games to help your students learn music instruments? This Bundle includes more than 80 worksheets from 4 sets. Click on individual file to see more info about each one. These worksheets and games take no prep - just print and copy. They can be used in private music lessons, classrooms, group lessons, sub plans, as homework and more! Percussion Instruments - Bass Drum, Castanets, Chime Tree, Cymbals, Gong, Glockenspiel, Hi-hat, Kettle Drum, Maracas, Marimba, Snare Drum, Tambourine, Triangle, Tubular Bells, Woodblock, Xylophone. String Instruments - Violin, Viola, Cello, Double bass, Harp, Guitar, Lute, Mandolin, Banjo and Zither. Woodwind Instruments - Recorder, Bassoon, English Horn, Oboe, Alto Saxophone, Tenor Saxophone, Baritone Saxophone, Clarinet, Bass Clarinet, Flute, Piccolo, Bagpipes, Panpipe. Brass Instruments - Bugle, Cornet, Flugelhorn, French horn, Trombone, Trumpet, Tuba. Keyboard Instruments - Accordion, Celesta, Clavichord, Grand Piano, Harpsichord, Keyboard, Pipe Organ. These worksheets are appropriate for a single student, small group, group class, music classroom, and music camp. I would appreciate your feedback, so please take a moment to leave a word and rating.